In stock -This product will ship today if ordered within the next 14 hours and 15 minutes. Natures Aid Red Yeast Rice provides 10mg of Monacolin K per daily serving. Monacolin K helps to maintain normal blood cholesterol levels. 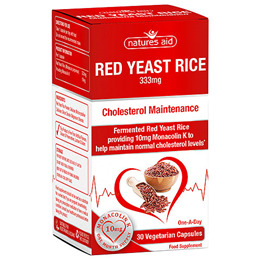 Fermented Red Yeast Rice (Monascus Purpureus) has been used for centuries throughout Asia. 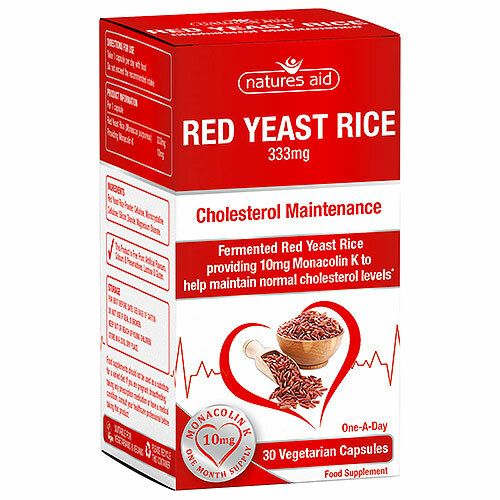 Natures Aid Red Yeast Rice capsules have been manufactured using the finest Non-GM approved rice to ensure ultimate purity and efficacy. Red Yeast Rice Powder, Cellulose, Microcrystalline Cellulose, Anticaking Agent (Silicon Dioxide), Magnesium Stearate. Take 1 capsule per day with food. Do not exceed the recommended intake. If you are pregnant, breastfeeding, taking any prescription medication or have a medical condition, consult your healthcare professional before taking this product. Below are reviews of Natures Aid Red Yeast Rice - 30 Capsules by bodykind customers. If you have tried this product we'd love to hear what you think so please leave a review. Natures Aid Red Yeast Rice provides 10mg of Monacolin K per daily serving. Monacolin K helps to maintain normal blood cholesterol levels.